Galerie au chocolat, a Canadian chocolatier, has teamed up with Planet Foods to bring his Fair Trade gourmet chocolate to Western Canada. This chocolate is not for the faint-of-heart; his flavours are intense! 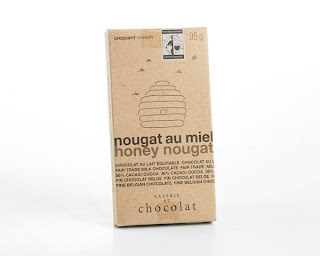 Incorporating real salt crystals, fiery chili, real honey nougats, crunchy maple, and flavourful cinnamon; Galerie au chocolat invokes a whole new experience while indulging in Canada’s favorite healthy snack. Try some Galerie au chocolat at your local specialty market or health food store today. Follow us on Facebook and sign up for our newsletter to get the latest on new products, events and giveaways! Posted by Planet Foods at 8:31 a.m.